“Indonesia is on a Different Path”: U.S.-Trained General Defeated After Alleged Plot to Rig Vote | Democracy Now! journalist and activist. He has reported from Indonesia for years, previously exposing government killings of civilians. JUAN GONZÁLEZ: We begin today’s show looking at Indonesia’s hotly contested presidential election. A quick count shows Jakarta Governor Joko Widodo has a several-point lead over former army general Prabowo Subianto. But Prabowo has refused to concede defeat. Official results won’t be known until after July 20. On Wednesday, both Widodo and Prabowo addressed their respective supporters and claimed a mandate to lead the nation. JOKO WIDODO: [translated] The fate of Indonesia is decided by us. We want a better Indonesia. We want all Indonesians to be healthy. We want our people to be educated, and we want our people to be civilized. PRABOWO SUBIANTO: [translated] We’re thankful that all the data show that we, the candidate team number one, Prabowo-Hatta, have received the support and mandate from the people of Indonesia. 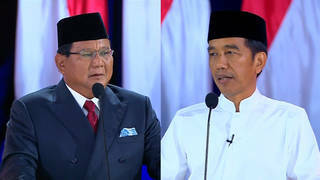 AMY GOODMAN: The American investigative journalist Allan Nairn recently reported Indonesian forces tied to Prabowo have waged a campaign to rig the election in his favor, including ballot tampering, street violence and threats against rivals. Prabowo, trained by the United States, has been accused of mass killings when he headed the Indonesian special forces in the '90s. Nairn's reporting on Prabowo became a major issue in the campaign, and Prabowo has now filed criminal charges against him, including inciting hatred against the Indonesian military. Indonesia’s presidential vote will mark its first-ever transfer of power from one elected leader to another. For more, we go to Jakarta, Indonesia, where we’re joined by Allan Nairn. Allan, welcome back to Democracy Now! We’re talking about the nation’s—we’re talking about the world’s largest Muslim nation. Can you talk about the significance of what at least the quick count indicates, the victory over Prabowo Subianto, the Indonesian general? ALLAN NAIRN: Well, I think this is a historic day. The prospect of fascism has been turned back in Indonesia. General Prabowo, who, by all accounts, lost, although has yet to concede it, is a mass killer. He, for years, worked for the government of the United States. He has called for abolition of the direct vote. He has mused about fascism and dictatorship, as he was talking to me. He has said that Indonesia is not ready for democracy. But he almost won. He was on the verge of victory, because of lots of money behind him, because of the covert operation he launched using the state’s own special forces and intelligence illegally to try to fix the election, and because he ran on a platform that was the opposite of his record. He ran as a defender of the poor, he ran as an opponent of the United States, when, in fact, for years he has helped the U.S. [inaudible], and for years, as he told me and as Pentagon documents verify, he worked for the Defense Intelligence Agency and with U.S. special forces. And this could have been a turning point that led back to the prospect of deep repression, as in the Suharto days, a rollback of freedom of speech, increased danger for advocates for the poor and for small farmers and small traders and people who fish for a living and those who dare to stand up against the army and the police. It was a real danger in the air, just 24 hours ago. But now I think it is dissipating. Now I think in Indonesia will be on a road where real progress is necessary—is possible if a popular movement can mobilize, because there are indications that Joko Widodo, Jokowi, the apparent president-elect, might respond positively if there is a mass popular movement demanding economic justice and demanding that killer generals be brought to justice. JUAN GONZÁLEZ: Allan, during one of his last official campaign rallies in West Java, presidential candidate Prabowo Subianto vowed to prevent Indonesia from turning into a kleptocracy. PRABOWO SUBIANTO: [translated] We are a democracy, and democracy is people power. But there is someone who would change it into a kleptocracy. And you know that the “klepto” means thieving or stealing. So the thief wants to be in power. JUAN GONZÁLEZ: That was Prabowo talking in West Java. Allan Nairn, your response? ALLAN NAIRN: Well, the main thieves in Indonesian politics were on Prabowo’s ticket. The most notorious oligarchs and corrupt government bureaucrats were backing him. This was his campaign method: He ran as the opposite of what he was. And he’s a very good public speaker. He’s a much better public speaker than Widodo. He’s a powerful demagogue in his style. And that’s one reason why he had a chance to win, why he was on the verge of victory. But in the end, enough people came out, they stood up, and, apparently, by all accounts, the general has been turned back. AMY GOODMAN: And can you explain who who they call Jokowi is? JUAN GONZÁLEZ: And, Allan, what about the elections themselves that were carried out? Were there any major problems? What was the level of participation? And could you explain this quick count versus an actual count, that will have to wait until July 20th? AMY GOODMAN: We’re having some trouble hearing you. But as we wrap up, if you could summarize what has happened in the revelations that you exposed in this last two weeks of this campaign against Prabowo, based on interview you did with him, what, some decade ago, that you started to write about now, and his response to those revelations? ALLAN NAIRN: Well, it became a major issue in the campaign. I quoted him talking about fascism and dictatorship, saying the country wasn’t ready for democracy, endorsing [inaudible] massacres if they’re committed in remote villages, and insulting a former president of Indonesia who is something of a revered figure—he’s a civilian, a Muslim cleric, highly respected. And all of these things, especially the insult of the former president, Gus Dur, became major issues in the campaign. The Prabowo campaign attacked me. We went back and forth. They called for my arrest. I said, “Go ahead.” And they backed down. But then, because they got so much criticism for backing down, [inaudible] for backing down, the final act of the campaign was to file criminal charges against me, for insulting—for inciting hatred against the army, in part. For whatever reason, Prabowo narrowly lost, and Indonesian history is on a different path. AMY GOODMAN: Allan, I want to thank you for being with us. Allan Nairn is an investigative journalist, reporting from Indonesia for years, has been exposing government killings of civilians. And we’ll continue to follow up on Indonesia’s presidential elections. The final results will be announced on July 20th. This is Democracy Now!, democracynow.org, The War and Peace Report. When we come back, we go to Glenn Greenwald’s latest exposé in The Intercept identifying five prominent Muslim Americans spied on by the National Security Agency and the FBI. Stay with us.